Williams Honey Farm: The art of the combine. 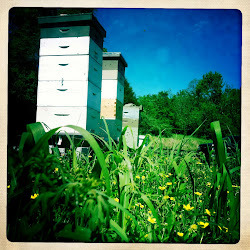 Chemical free beekeeping without all the fuss. The art of the combine. I’m starting to think that beekeeping is really all about breaking apart and putting hives back together. You break them apart to make more and then the ones that don’t seem to take, you put right back together. It’s exciting and then very humbling all at the same time. This time of year, it’s all about putting hives back together. I know what you’re thinking. You tried so hard to get that hive through the booming spring, hot summer, and beetle prone fall. You have invested time and money on keeping that hive going. The truth, as I see it, is you’re chasing the rabbit. If you’ve put that much effort into raising a good queen through the most productive months of the year and she still isn’t impressing you, it’s time to move on. You’ll just end up spending more money on feed through the winter. Some queens just don’t cut it and the sooner you can see the bigger picture the sooner your beekeeping operation can move forward in a more profitable direction. So what’s the best way to combine colonies? I don’t know, but I’ll tell you how I do it. The newspaper combine in my opinion is the best and easiest way to marry two colonies. As a rule of thumb, always combine your weaker colony with a stronger colony. Do not combine two weak colonies together. Find your failing queen and remove her. I like to save her in a small bottle filled with rubbing alcohol and use her pheromones as a swarm lure for next spring. It's a lot cheaper than having to spend $15 for someone else to make it. Take a single sheet of newspaper and place it between your two hives as you have just combined one on top of the other. I like to give the bees in the top boxes a way out if they wanted (or a way in) so I leave a solid inner cover on top with open vent holes to allow for traffic or stragglers. If you want to get all technical you can leave your weak colony queenless for 24-48 hours and then combine it with a stronger colony. I don’t like to do that because a queenless (already weak colony) is a beacon for small hive beetles or other pests. Another thing that you could do is spray the weaker bees with sugar water and a hint of vanilla extract. It will act to mask the original queen’s pheromone and allow for quicker acceptance. Also, the bees will be too busy cleaning themselves off to worry about fighting. Take your hive tool, cut a few slits in the newspaper to get the bees started and then close it all up. Within 24-48 hours the bees will chew their way through the paper and the new bees will be accepted making one large colony. I like to leave the colony alone for a week. After 1 week I’ll come back, make sure all is well, and take a big slice of humble pie. My attempt at making a split did not work. If the hive makes it through the winter successfully, you can bet I’ll give the split another try next year and continue the circle of life. **Side note: even if you have combined 2 colonies and now have tons of bees and a strong looking colony make sure you have enough honey stores to make it through the winter. If you are low, feed, feed, feed. hi, all the best for your adventures. Honey gives good health to body and it contains lot of medicines characters. Honey is compare with herbs. Most of people thinks that honey is one of the herbs because it's uses is large. People like to take herbal medicine treatments because it is natural treatments. What's Springing Up this Spring? Our honey is produced by bees raised without the use of chemicals, antibiotics, are any harmful treatments of any kind. (C) 2011 Williams Honey Farm. Awesome Inc. theme. Powered by Blogger.